The 6 hour fast track was already used on a few occasions with the MS version of the Soyuz spacecraft but requires a very precise set of maneuvers that are possible when the Station is in a certain position. Moving launch date from March 15 to March 21 was the main problem, a decision connected to a number of other considerations such as the plans to launch the next space cargo ships. With the current position of the International Space Station the Soyuz MS-08 needed to perform a different set of alignment maneuvers to reach the docking point and the 2-day track makes it possible to accomplish them much more easily. 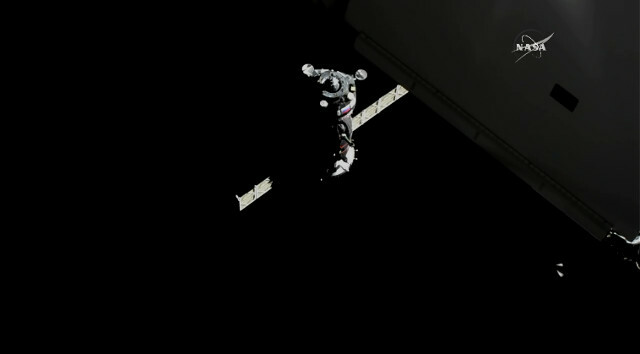 Due to the schedule changes, for more than three weeks the Station had a reduced crew on board, with only the three Expedition 54/55 crew members. With the full crew, it will be possible to proceed at full speed with routine operations but also with the others. Preparations for a spacewalk outside the International Space Station will soon begin, the Progress MS-7 space cargo ship is scheduled to leave the Station after being filled with garbage and obsolete hardware while a new Dragon space cargo ship is scheduled to be launched at the beginning of April. After the Soyuz MS-08 spacecraft’s docking with the International Space Station’s Poisk module, the procedures that will lead to the opening of the hatch begun. Soon the new crew members will physically enter the Station, where they will be greeted by their colleagues with a short welcome ceremony. Their return to Earth is scheduled, unless there’s a change of plans, for August 28, 2018, at the end of Expedition 56.